Fun bold and simple design. 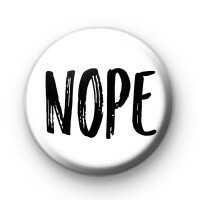 This Black and White NOPE pin badge is written in a lovely brush font and just lets everyone know you're not in the mood for their BS. You're not feeling tip-top and just want to be left alone.